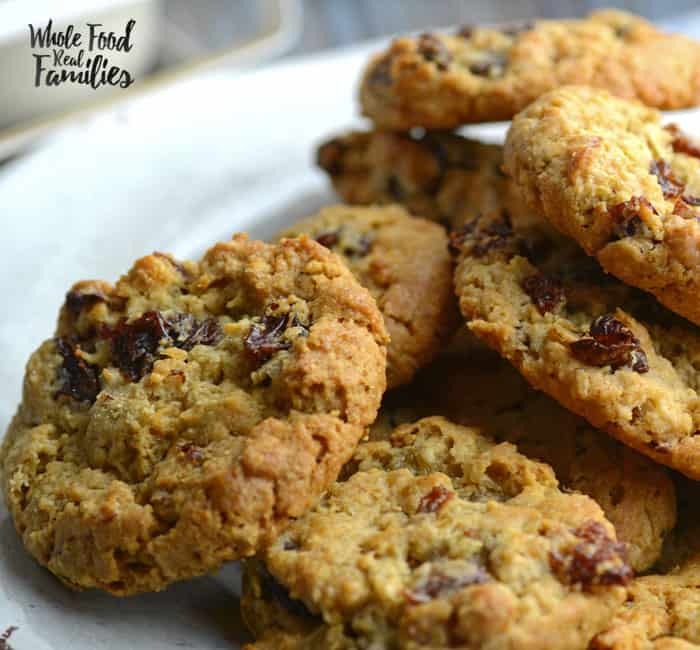 Healthy Cinnamon Maple Oatmeal Cookies satisfy your sweet and treat cravings with a healthy combination of oats, maple, and cinnamon. Asking your kids to eat less refined sugar can be a struggle day to day. We try very hard to find compromises that work because food is social. And sharing special meals and treats are a part of everyday life, especially once kids enter school and are surrounded by other kids. We don’t want our kids to feel deprived (or be deprived ourselves for that matter!) but rather we want them to develop their own sense of moderation and judgment. The journey to that goal has been different with each of our children. The journey is now a little easier for all of us with these Cinnamon Maple Oatmeal Cookies in the house. So dessert is part of the recipe repertoire in our house. It is not banned or even frowned upon. We simply try to focus on more nutritious options and moderation. If you have hung around the blog for long, you have seen some of those efforts. Like Healthier Chocolate Muffins, that become cupcakes if you frost them with Buttercream Frosting. We love this Chocolate Nut Butter Smoothies for breakfast and Fresh Fruit Pizza when the berries are in season. I am a pretty good cook but every once in awhile, I hit one out of the park. 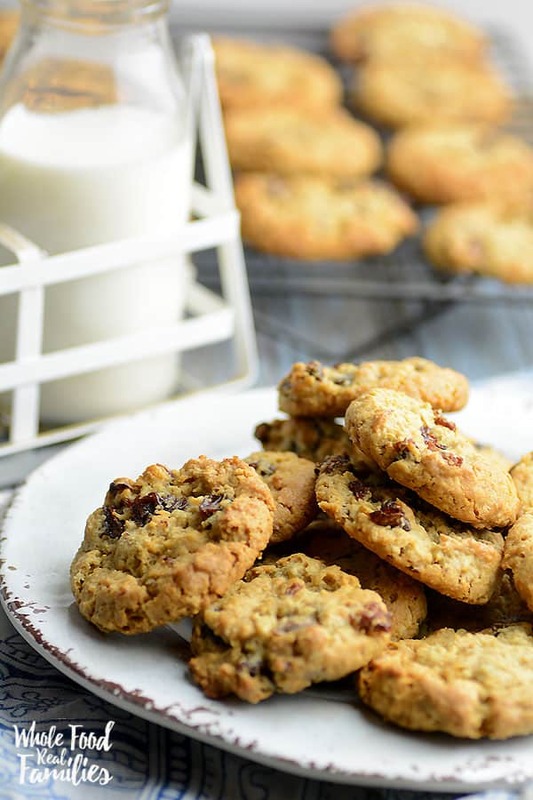 These two dozen cookies use 3/4 cup of maple syrup as the sweetener – as opposed to twice that amount in most other recipes – some used as much as 2 cups of sugar. These cookies also use whole wheat flour as opposed to traditional white flour. But the maple and cinnamon give the cookies such an intensely homey, warm taste that nobody missed what was missing. 🙂 These cookies were so good that I couldn’t keep everyone out of them. In fact, they were so good that I thought my kids were going to revolt before I could get the pictures taken. The minute I pull out the camera, my kids head for the table to see if there is anything good there they can swipe. This time, my 5 and 7 year olds were in cahoots. It became more and more difficult to get a good picture of these cookies because I had fewer and fewer to work with. No wonder we went through two dozen of these in a day. In the meantime, I am headed back to the kitchen to make more of these cookies. This time, I am doubling the recipe. 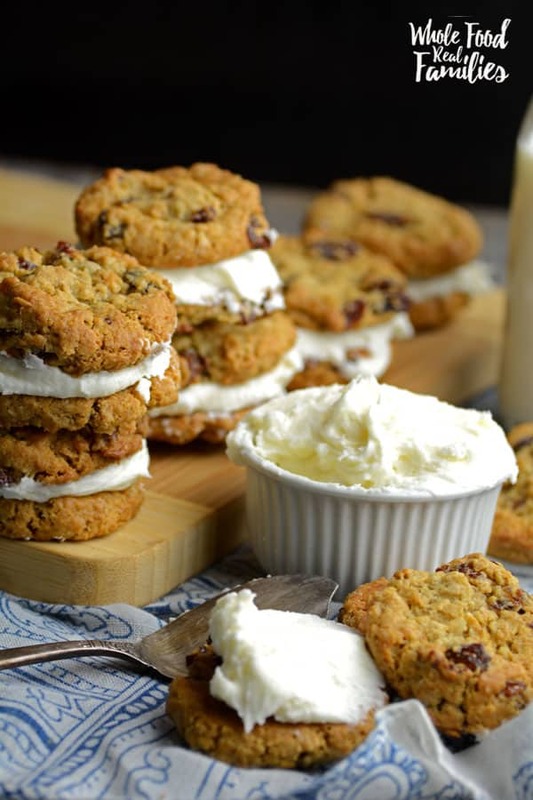 If you are feeling crazy, whip up some of our Buttercream Frosting and make these Oatmeal Cookie Sandwiches! 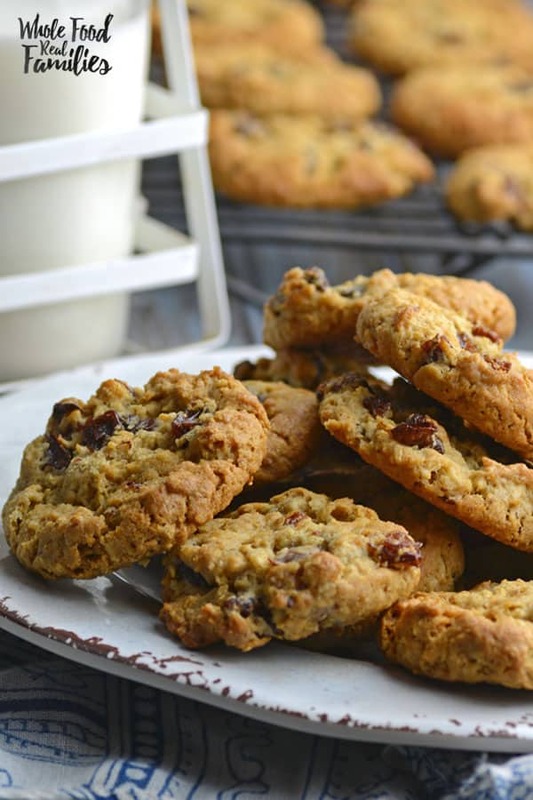 Do oatmeal cookies make you think of fall? I love fall baking and these are always on my list. 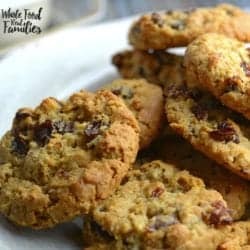 These Fall Cookies are some of our very favorites! And our kids love theses Oatmeal Breakfast Cookies that use bananas as a sweetener. They are a regular part of our morning school routine! In your stand mixer, whisk butter and maple syrup on medium speed until creamy. It might look a little weird for a second but it will come together. Add eggs and vanilla, and whisk until combined. In a second bowl, combine whole white wheat flour, baking soda, cinnamon and salt; mix until uniform. Slowly pour into the butter mixture, mixing on low until combined. Switch to the paddle attachment, or using a rubber spatula, add oats and additional add-ins (if using); fold into the dough until combined. Drop dough by rounded tablespoonfuls onto ungreased cookie sheets. Bake 10-12 minutes or until light golden brown. Cool for a minute on cookie sheets so they don't fall apart when you move them. Then move to wire rack to cool completely. These are the best oatmeal cookies. I’m glad they can be made gluten free also. I added nuts raises and a little coconut. Thank you so much!!! The pictures really impressed me. They looked yummy and they are. I love them too! Your additions sound delicious. I love coconut! A really yummy cookie that’s not overly sweet. Definitely five star caliber. I made them with pecans (no raisins as my spouse won’t eat them) and he loved them. Of course he thought chocolate chips (his favorite) would make them perfect. I was think white chips and cherries or cranberries and they’d be beautiful on a Christmas platter. A definet do over; thank you very much for sharing this tasty recipe. Made these today and perfect amount of sweetness- love that it uses maple syrup instead of sugar. I hate to say this, but I absolutely hate when people comment who have not made the recipe. Considering that is most of what was in the comment section I almost did not make these. I know, this may be weird, but I like to see if others liked the recipe or what alterations they have made. Wow, that would have been a mistake. When I suggested these cookies to my picky 6 year old the response was “Gross. Just make normal chocolate chippers.” I made the dough, asked if she wanted to add chocolate chips, she begrudgingly said yes and helped with that. In full disclosure, I did vary slightly from the recipe: I have a backyard flock giving me medium-ish eggs so I used 3 and I doubled the cinnamon. I almost added extra warming spices but decided against it. As soon as they were out of the oven, cooled slightly, and put on a cooling rack she asked if we could share one. Well needless to say she ate the whole thing, took one to my husband, and brought me my own. We ate about one third of the cookies in one sitting. I have convinced myself it is ok since these are healthier than our regular cookies. I will be adding these to our normal rotation of home made baked goods. They are delicious! I like them too. I actually created the “healthier” version because of my own kids. My desire was not to keep them from having treats but to make the treat a little more balanced with some actual nutrition too. So glad you loved them. You made my day. I halved the recipe as we’re a family of three and I don’t give my 2 year old a lot of sweets. I baked 16 cookies in total and for us they are the perfect snack size, so smaller than a regular cookie. I used coconut oil instead of butter and did not add any extras mainly because we did not have any. But next time I’d like to add some chocolate chips. So super delicious! I’ve been trying to switch all my baking to Maple sugar or honey and these are a keeper! Thanks! I just made these cookies . They are delicious! Thank you for sharing your recipe. Super easy to make and yummy. But out of one batch I got 45 cookies and the size on mine don’t look too different than the pictures! More to enjoy and I bet they freeze well. Hope to make these tomorrow with my girls! I was wondering if your cookies spread in the oven or if you have to press down? Maple brings out this lovely chewy carmelized texture that I love in cookies! You just made my whole day! I love these cookies too!!! Thank you! I’d wondered if I could use Namistay flour – glad to know it’s been used successfully!